Philippe finally took his work and published it as a book, thinking that others in the community would be interested in what took years of his life. We get a shout-out in the book, Burners.Me is thanked for being the “counter-culture” of Burning Man. The book was featured in Architectural Digest, WIRED, Curbed, and CNN. After 21 burns and 10 years blogging it’s time to call it quits. in an inhospitable environment while having fun, mostly. my ethereal gift to the community. as the various art installations all along the playa. My secret fantasy was to have an informal and zany ceremony were I could give away the physical Golden Rebar Awards. Instead of that, I made a book. The result was a burner worthy book with a tactile cloth cover and blind embossing, packed with info, data, tips and, most of all, a very large visual spectrum of our vernacular architecture. From around the world 289 buyers daringly purchased this self-reliant project. This dismal performance resulted in several drastic personal changes. to publish limited edition books of two talented playa photographers. Time to burn the page. without any Black Friday, French tickler Sunday or Tutu Tuesday. and one less overwhelming blog to read. Support Philippe and buy one of the limited edition books before they are gone forever. It’s really very good, the range of Burnitecture on display is truly mind-blowing. Big thanks and much kudos to Philippe for taking the photos, and all the imaginative Burners who created the structures. The Global Leadership Conference for 2018 has been called off, perhaps to avoid answering awkward questions raised by our Shadow History of Burners investigation. 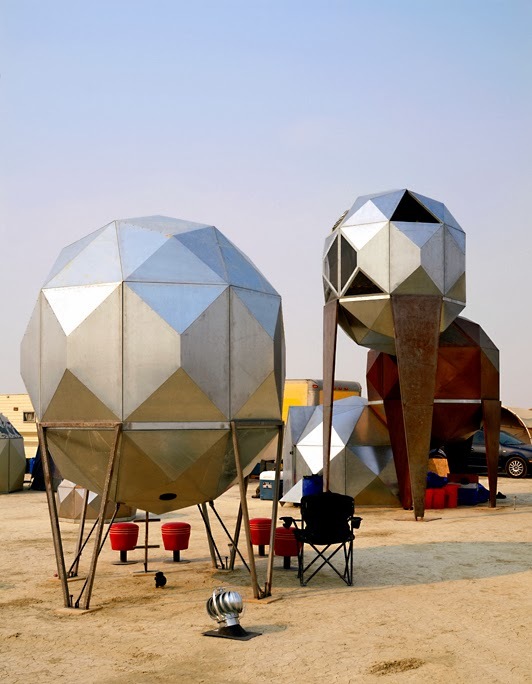 Is this it for Burning Man now? Are people just over it? Is it really a lifestyle and ideology that can change the world, or is it just a fun party for one week a year? 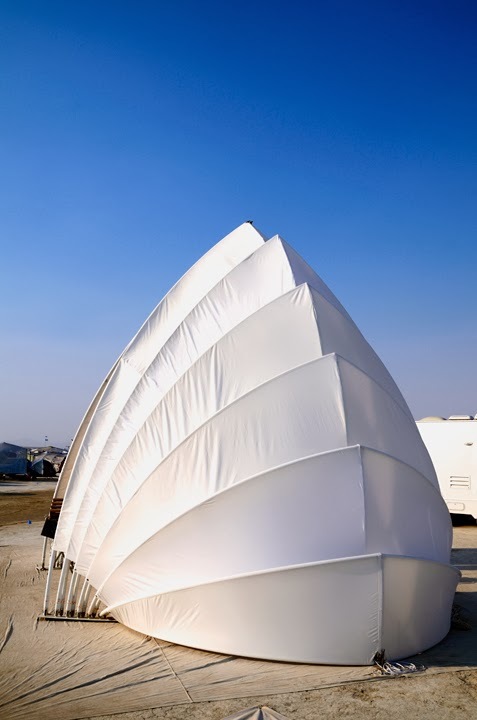 Will other temporary cities emerge with this kind of ephemeral architecture? I sure hope so. Serene is the least word you would associate Black Rock City with. Cloud Extruded. Courtesy of Philippe Glade. The Chiton. Courtesy of Philippe Glade. Sacred Spaces Village. Courtesy of Philippe Glade. Read more at This Is Black Rock City. 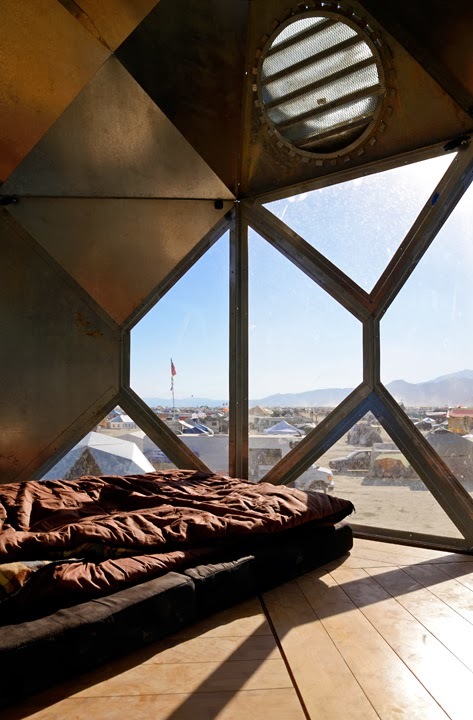 Philippe Glade is the author of old-fashioned paper book “Black Rock City, NV – the Ephemeral Architecture of Burning Man“. On his site, thisisblackrockcity.blogspot.com , he hands out “Golden Rebar” awards to the best structures at Burning Man. 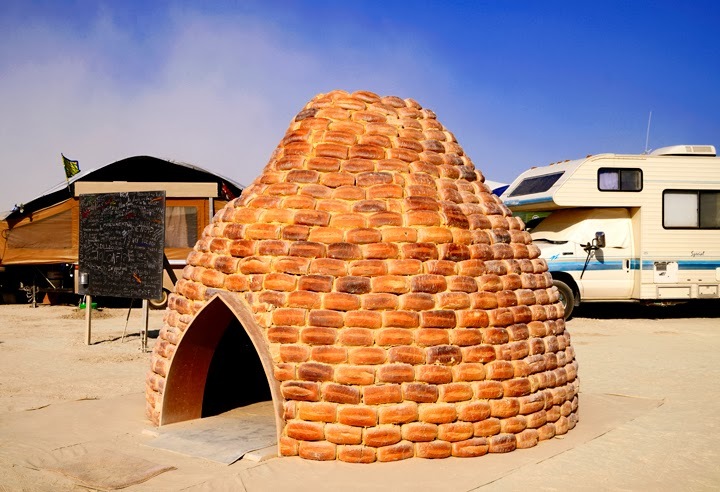 2013 features some real doozies, incuding an igloo literally made of bread. We’ve picked our favorite three. See the complete list of 2013 winners here at Philippe’s site. 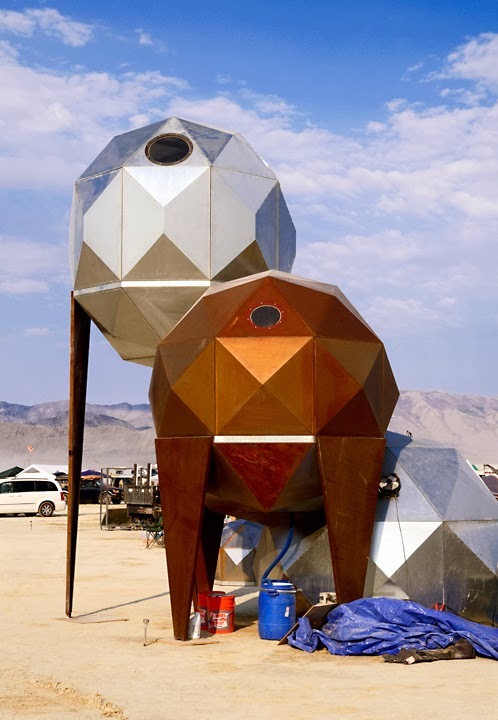 When last year Scott “Tin Man” Parenteau came for the first time to Burning Man, he became an instant celebrity on the playa with his walking pod that since brought him several awards at Maker Faire, and with his two patented metal pods used for shelter was a big draw for his neighbors. 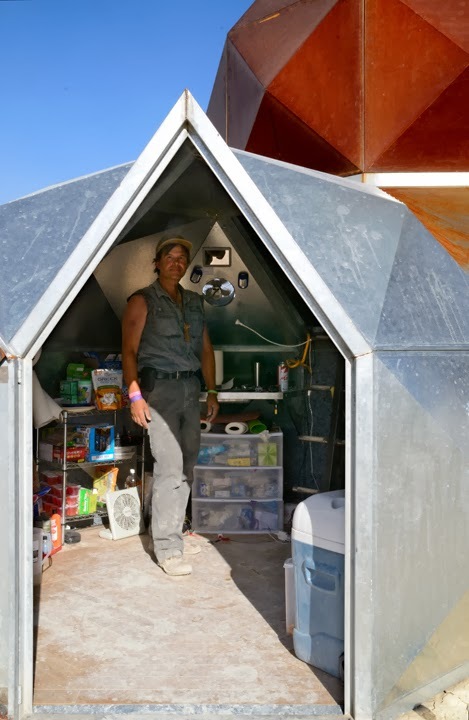 For his second time at Black Rock City, Scott upped the ante and decided to build a village for his friends. 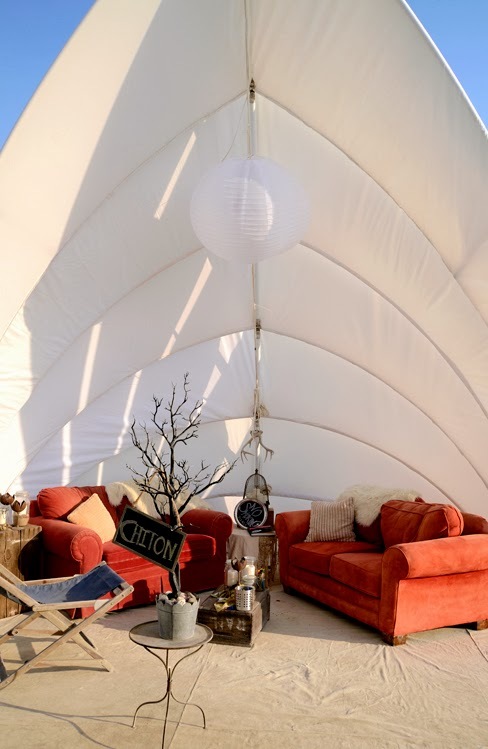 He was able to finish his own shelter by adding the third pod, the bedroom on top of a fully operational stainless steel custom made shower and a complete kitchen. A bedroom with a view and bamboo flooring. This Shelter was entirely made of 850 Loaves of Bread with an insulation value of R-5 and lasted the week. Do we witness the start of a new building trend at Black Rock? Golden Rebar for BRC Landmark: The Chiton by D’Milo Hallerberg. 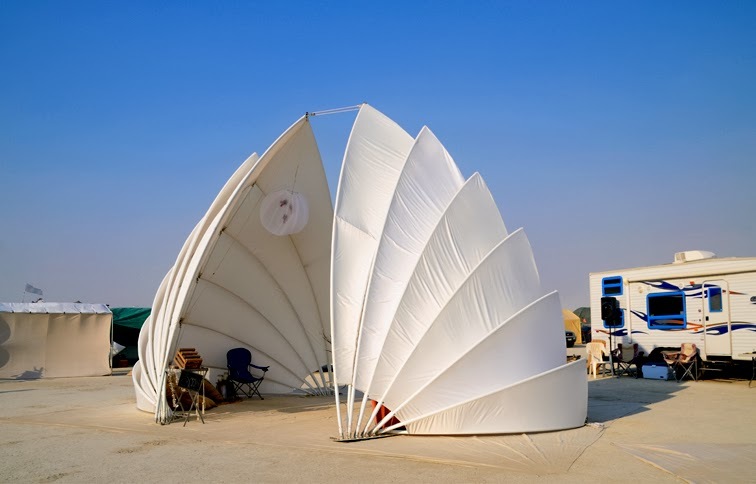 architectural concept and art installation, a feat few architects in the default world are capable of. It measures 21 feet high, 22 feet wide and 45 feet long. 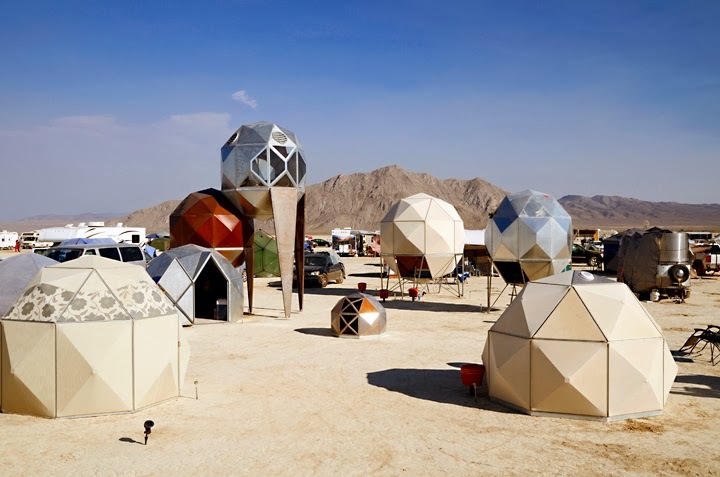 It’s great to see the experimental architecture of Burning Man being celebrated and highlighted like this, and we appreciate Phillipe’s efforts. He must be favored by the BMOrg, since he is allowed to use their trademarked term “Black Rock City” to promote his book.